Description: Q342 passes the B&O inspired CPL signals at Deshler, Ohio. Description: Stuck in the hole for Q121, CSX train Q180 gets back underway after the meet at NE Woodland, GA on the Fitzgerald sub. Description: CSX trains Q121 and Q180 meet at NE Woodland on the Fitzgerald sub. Description: The turntable at East Thomas Yard. 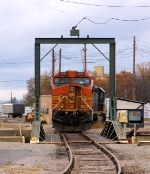 Title: A westbound stack train with two warbonnets heads west. Title: One more shot of this short stack train heading west. Description: 5093 leads a freight eastbound on CSX past the site of the old Stateline Tower. Description: Two C44-9Ws roll north with a string of M1A2 Abrams tanks and wrecked tank cars loaded on flat cars passing through Saginaw Interlocker. Description: BNSF 5994 waits while BNSF 5093 slips off into the middle tracks for a pass at Vancouver north yards under blue skies. Description: K038 drifts through Park at 1538.